My first official MLB game of 2012 came with quite a few surprises. Despite the rain-delayed first pitch and the game being called due to that very same storm 7 and a half innings later, it was a fun time. The A’s lost 3-0, but the action on the field was nothing compared to the gloriousness that took place in the right field bleachers. As I understand it, the right field bleacher crew, (some of the most die hard fans in baseball, I assure you of that) started a tradition last year of bringing bacon treats to Tuesday home games. When the Royals strolled into town, their right fielder was intrigued by the tradition. Because A’s fans are the coolest kids around, they developed a unique bond with Mr. Francoeur (aforementioned right fielder), and donated some bacon to his mouth. He responded by tossing them a baseball with a $100 bill wrapped around it. Needless to say, the right field bleacher crew at A’s games is now in love with Francoeur, and it seems as if the compassion is shared equally. I was at the game on Tuesday, and every time Francoeur came out to the field, the fans chanted his name and he turned around and smiled or waved. He seemed to be having a legitimately great time with those fans, a rare spectacle for a visiting player. By the way, Frenchie (as he’s affectionately known) scored major points with me. I thought he was just a “blah” player with below average stats, but he’s clearly the greatest player in the game today. I mean…he loves bacon! Anyway, when they came back to the Coliseum this week, the right field bleacher crew had shirts ready, reading “2nd Annual bacon Tuesday,” and below that, “Sponsored by Jeff Francoeur.” Yes, he got a shirt. Duhh. I chowed down on chocolate-covered bacon. Incredible, of course. Chocolate. And bacon. A match made in heaven. Then I was handed a bacon-wrapped jalapeno stuffed with peanut butter. It was a little strange, naturally. But entirely enjoyable. The most memorable treat came in the form of a pretzel stick. Ready? Wrapped in…candied bacon. No, there’s more…DIPPED IN NUTELLA. My mouth just started watering like Niagara Falls remembering that finger-lickin’ morsel. A’s fans, and baseball fans everywhere – let’s be real. The A’s could use a little revenue. 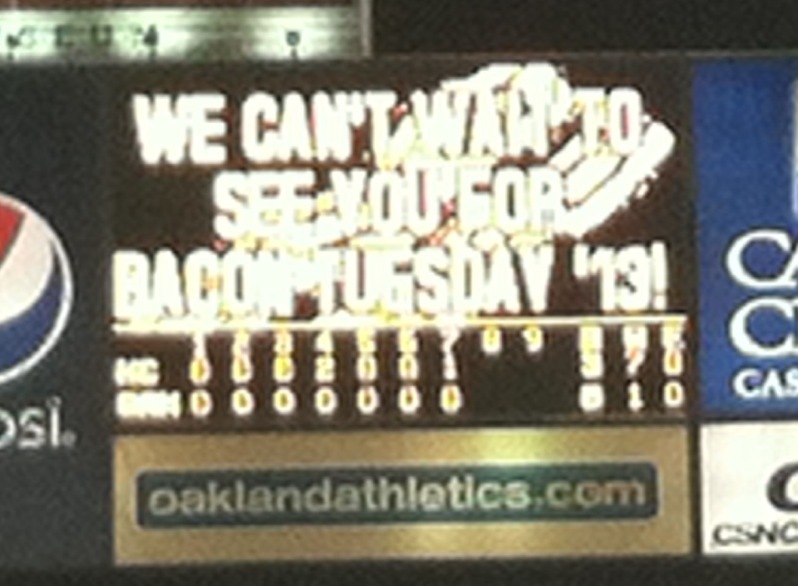 So go to o.Co, especially on Tuesdays. You might get to share in the epicness of the bacon treats. Which may very well be the greatest things ever created. Hashtag: NOM.